An Outhouse is a small structure that is intended to house a simple non-flushing toilet separate from a main building. Its primary function is to provide privacy and a place to deposit human feces. Although not a popular as say 50 years ago, they are still very popular in many back country settings for those folks looking to explore the beauty of these environments. 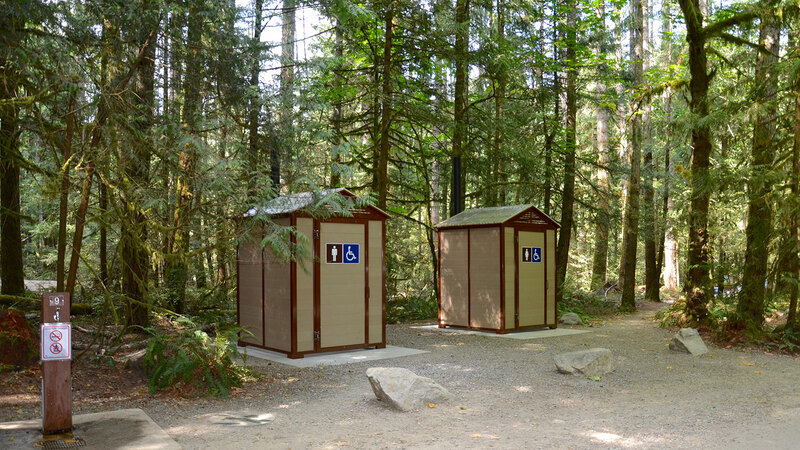 Since many of our benches, picnic tables and waste receptacles are also in these environments, a request came in from one of our customers to take the same attributes ,that have made them successful (design, low maintenance, long lasting) and apply them to Outhouse Structures. Always up to the challenge we did, and for now over 10 years our buildings have been recognized as a premium product in this sector. They have performed beyond our expectations and the comments we get all the time, from the folks that use them to those that maintain them, reinforces the decision we made years ago. The icing on the cake that makes them really desirable in these locations is the shipping and assembly. They are shipped completely unassembled and each component can be carried in either manually, on horseback, or if the budget allows by helicopter. At the location most of the buildings can be fully assembled with 2 people in under 2 hours.